There is a biodiversity myth that “more species” is better than “fewer species”. Even when the species are failed or useless species. The myth counts the 5 mass extinctions of the past as “bad events”, even though many current species (including humans) could not have evolved without the mass extinctions creating the space for new species. Every mass extinction has provided a cleansing (though not always effective) process for removing the failures of evolution. The alarmist brigade are publicising a paper which claims that 1 in 6 species will go extinct due to global warming. (I note that the paper refers to global warming but all the publicity quotes “climate change”. What if the climate change was a global cooling?) The paper published in Science is a nonsense speculation and the abstract begins “Current predictions of extinction risks from climate change vary widely depending on the specific assumptions and geographic and taxonomic focus of each study.” He then goes on to selectively review the literature and chooses just those papers which support his conclusion. The author, Mark Urban, really has no value to add to anything about the climate and has just used the most “politically correct” opinion which ensures his funding and his publication. He uses “politically correct” assumptions to come to – surprise, surprise! – “politically correct” conclusions. He is a biologist but his “suggestions” about species and species extinction are equally valueless. He concludes that if global temperatures rises by 4ºC then up to 1 in 6 existing species will go extinct. Both the magnitude of global warming and the effect of warming are assumed (by the author and the papers he chooses to cite). The argument is circular. He assumes that the extinction of 1 in 6 species is a “bad thing”, even though there are more species now than ever before. The sheer number of species in existence today is an indicator of how inefficient the process of evolution is. There are more failed species struggling along today and which need to go extinct, than ever before. It is my thesis that there is an optimum number of interconnected species to suit any given conditions. Evolution does not go for the optimum and because of the ineffectiveness of the process produces a great deal of “rubbish”. It is my contention that the Earth desperately needs another mass extinction to clean out the accumulated and accumulating muck of the “rubbish” of failed species. Evolution fails in over 99% of its attempts to create species that can survive. The 1% of species that do and have survived may seem to be perfectly tailored for the prevailing conditions but that is putting the cart before the horse. Evolution has no direction and does not seek excellence. It only throws up a plethora of species where just 1% of those species happen to suit the prevailing conditions. The “conservation” movement and its blind worship of “biodiversity” borders on the stupid. Failed and useless species are given as much weight (sometimes more weight) than successful and useful species. Failing species are protected and successful species are persecuted. Useful species are hunted and useless species are coddled. 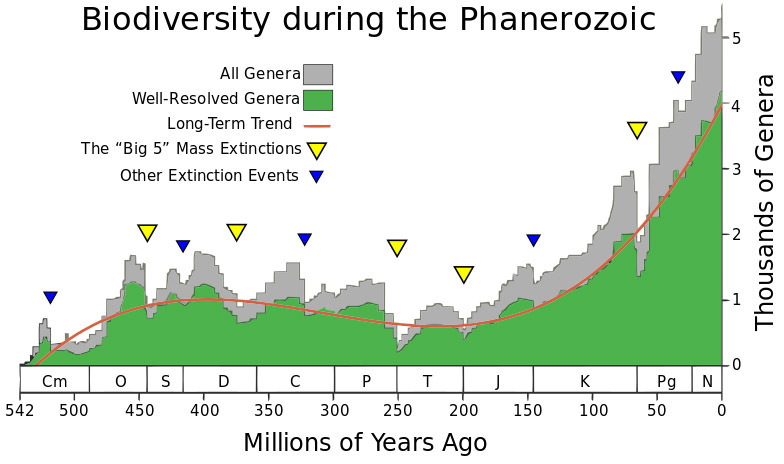 The 3rd and 5th mass extinctions probably reduced the then existing number of species by about 50%. More than 30% of the species alive today (plant and animal) could be considered failed species – where a “failed species” is one which cannot cope with current change, or provides no benefit to any other species, or is in an evolutionary cul-de-sac. These species need to be allowed to go extinct or – when they are harmful to human or other life – to be terminated. This entry was posted on May 1, 2015 at 7:33 am and is filed under Alarmism, Biodiversity, Biology, Evolution. You can follow any responses to this entry through the RSS 2.0 feed. Both comments and pings are currently closed.